Unlike Metro Boston, BostInno’s Steve Annear got the point of the demonstration. 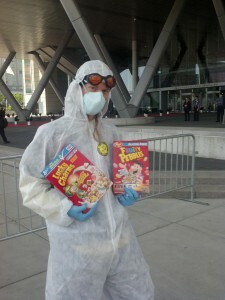 Chris Rotten holds up boxes of cereal in protest of genetically modified foods. “We are here to tell them to stop using GMO’s. Stop contaminating our food—we want organic farms, not giant industrial farms poisoning our people,” said Rica Madrid. 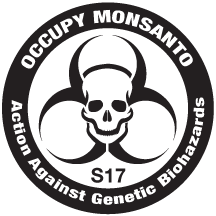 Madrid is a member of Occupy Monsato, a group fighting against the multinational agricultural company and producer of genetically engineered seeds. The group, which banded with members of Occupy Boston and others during Monday’s protests, will be holding larger rallies against the company in the future. Madrid said the Genetically Modified Organisms used in food produced by Monsato could have long term adverse health effects. The convention, which runs from June 18 through the 21, is slated to bring thousands of biotech firms and businesses to the Bay State and pump close to $26.8 million into the local economy, according to officials from Mayor Thomas Menino’s office. To attract some of those global businesses to the Hub, Menino and staff form the city’s Boston Redevelopment Authority have implemented a plan to “pitch hot prospects,” including tours of Boston’s life sciences clusters and meetups with CEOs. “Boston is a global life sciences hub – a super cluster – it is innovation, collaboration and success. 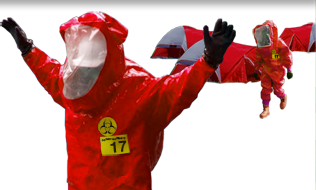 I’m pleased to invite the world to our city,” Menino said in a statement. Governor Deval Patrick kicked off the week long event, welcoming businesses to Boston, during a speech this morning. Protesters did not go inside the event because the amount it cost to attend. They said they didn’t want to give additional money to the large corporations.